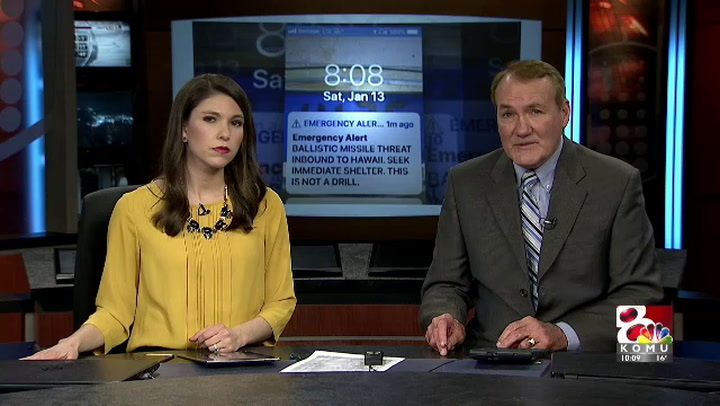 JEFFERSON CITY - The Missouri State Highway Patrol says steps are in place to ensure people here don't get the kind of terrifying alert sent out in Hawaii Saturday. The alert warned a ballistic missile was on its way and said "this is not a drill." KOMU 8 News asked the highway patrol if something similar could happen in Missouri. Capt. John Hotz said Missouri, unlike Hawaii, employs a two step verification process before any alert is sent out. "There are at least two levels of approval that any alert goes through here," Hotz said. "It would never be on one person here that would send that message out." Since Missouri is located near the center of the country, the state has the luxury of taking extra time to verify threats. "National emergencies in this state are completely handled by the federal government," Hotz said. "A Missouri specific alert would come from the Missouri Department of Public Safety, it would be first approved through them and then it would be sent to us. Then of course we would verify it again and then we would send it out over the emergency alert system." To be clear, he said, a missile alert would never come from the state level. A earthquake, flood or tornado are examples of events that would trigger alerts from the state. Missiles or any other catastrophic event would always be handled by the federal government in regards to the mainland United States. According to CNN, North Korea's latest Intercontinental Ballistic Missile test shows that the country is capable of hitting the entire U.S. mainland. Hawaii, like Guam, partially serve as barriers between the Asian continent and the U.S. mainland. Because they are much closer to North Korea, a one step alert is used to save time. Charles Uyehara lives on the east side of the island Oahu, near Honolulu. He told KOMU 8 News time is of the essence once an alert is sent. "We have been told that we really only get 10 to 15 minutes warning before a missile makes contact," he said. "There isn't much we can do here. They're aren't large concrete structures to hunker down in. Our plan was just to take what shelter we could and wait." Uyehara said when he received the false alert Sunday he feared the worst. "I was finishing up breakfast at McDonalds when the alert came in," he said. "I looked around and it didn't seem like anybody else got the alert but I knew that something was going on." Uyehara said he walked outside and listened for the air-raid sirens. They never went off. Still, fearing the worst, he scrambled to gather his family. "I packed up my stuff and got in the car and went to find my wife who was working out at the local YMCA," he said. "I saw a few cars driving really erratically on the highway. It's amazing something terrible didn't happen in those minutes of uncertainty." Uyehara said he did not see the widespread panic that was shown on the national media. He believes it was exaggerated from a few isolated incidents. "I feel bad for the guy that made this mistake, but we have to fix this and move on," he said. I'm sure this will be a day that we talk about here for a long time." In an interview with reporters immediately after the false alert, Hawaii Gov. David Ige told reporters the mistake was unacceptable. “I’m, too, very angry and disappointed that this happened. We are doing everything that we can immediately to ensure it never happens again,” Ige said. Since the false alarm, Hawaii has moved to review its alert cancellation procedures and has suspended drills for the time being.